The geochemistry community lost a colleague and a friend with the passing of Robert Jackson (58) last July after more than a year battling ALS. Robert graduated with a B.Sc. in Geology from Queen’s University in 1973 and immediately entered into a graduate program at Queen’s, under the supervision of Dr. Ian Nichol. Robert’s research on lake-bottom sediments as an exploration medium in the Canadian Shield began his long career as an exploration geochemist. These were the early-days of lake-bottom sediments applied to mineral exploration, so Robert and his co-workers made significant contributions to the technique. Robert received his M.Sc. from Queen’s in 1975 and then took a position as a geochemist with Saint Joseph Explorations Ltd. Although he was based in Toronto, much of his time was spent in Northern Canada applying and developing geochemical techniques applicable to that environment. After working with Saint Joe’s, Robert was a private consultant from 1987 to 1993, but he jumped at the opportunity to work for the Ontario Geological Survey (OGS), preferring scientific pursuits to routine surveys. While at the OGS, Robert trialed some of the early experimental techniques to geochemically detect mineralization buried beneath transported (glacial) overburden. In 1995 Robert was offered the opportunity to work in the word-class gold districts of Nevada as a geochemist for Newmont Mining. There, he applied some of the same techniques he had tested in Ontario, but now for buried mineralization in the Basin and Range region of Nevada. While in Nevada, Robert began experimenting with 3D display and interpretation of geochemical multi-element zoning patterns surrounding gold mineralization. This work lead to the development of an integrated 3D model for element zoning around Carlin-style mineralization. This work provided Robert with a niche skill and in 2002 he struck out on his own, as a consultant. His consulting work came from many diverse regions in the world so he and his wife, Daphne, decided to be based in Dartmouth, Nova Scotia moving there in 2004. In addition to his involvement with 3D deposit alteration modeling, he continued to work and conduct research in surficial methods of mineral exploration. 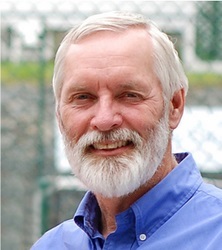 Robert served as an Association of Exploration Geochemists council member from 2002-2004 and was author of many professional articles, papers and presentations. Robert enjoyed interpreting geochemical results most of all. If a particular survey generated data for 50 elements, in three size fractions, you could bet he would generate 150 maps, each with a carefully-reasoned interpretation. To the best of this writer’s knowledge, Robert holds the record for the spreadsheet with the most tabs. In 2007 Robert designed a comprehensive multi-media surficial geochemical study for uranium in the Athabasca Basin, on behalf of companies participating in a Camiro study. Regrettably, his illness precluded his field involvement in this significant study, but he managed the program from his home office and proceeded to produce a remarkably comprehensive report in spite of his steadily debilitating condition. He passed away within just a few weeks of submitting his report - a testimony to his passion for the discipline of exploration geochemistry. Robert was equally passionate about things outside the world of mineral exploration, including entertaining, fine food and wine. While at graduate school, he turned many of his colleagues on to peanut butter and banana sandwiches as the perfect field lunch. During his adult life, he and Daphne tag-team cooked to serve up sumptuous meals to vagabond geochemists passing through. Robert was also an avid and skilled tennis player for much of his life and participated in many tennis club activities and competitive tournaments. He was also a keen bridge player, with several trophies to his name. Robert is survived by his wife, Daphne Cruikshanks of Dartmouth; brother, Terrence of Plymouth, England; stepmother, Jean Jackson; stepsister, Gayle Bates; stepbrothers, Greg (Bev) and David Jackson, all of Vancouver Island, B.C. ; stepsister, Catherine (Bill) Knox of Kelowna, B.C. ; sister-in-law, Robin Jackson of Ottawa, Ont. ; sister-in-law, Margaret (Joe) of Maghergall, Northern Ireland, and many friends and extended family members. He was predeceased by his father, George Melrose Jackson of Vancouver Island, and mother, Eileen (Greenlaw). Compiled by Owen Lavin with help from Daphne Cruikshanks, Lynda Bloom, and Colin Dunn.